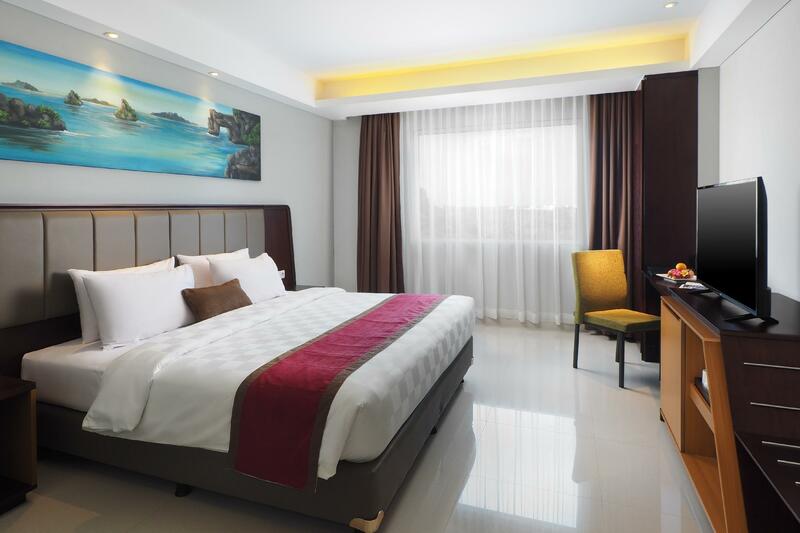 Designed for both business and leisure travel, Prime Plaza Hotel Kualanamu Medan is ideally situated in Medan Tembung, one of the city's most popular locales. From here, guests can make the most of all that the lively city has to offer. With its convenient location, the property offers easy access to the city's must-see destinations. Prime Plaza Hotel Kualanamu Medan offers impeccable service and all the essential amenities to invigorate the weary traveler. The property offers access to a vast array of services, including free Wi-Fi in all rooms, 24-hour room service, 24-hour security, daily housekeeping, wheelchair accessible. 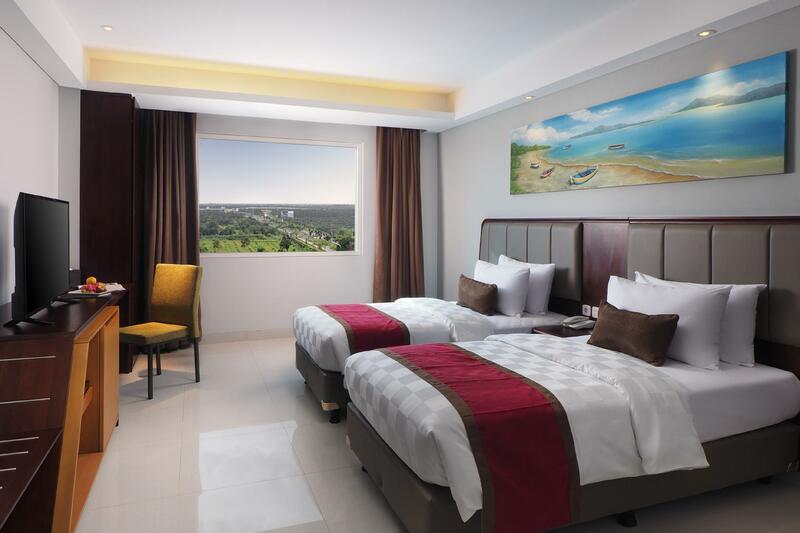 The ambiance of Prime Plaza Hotel Kualanamu Medan is reflected in every guestroom. clothes rack, complimentary instant coffee, complimentary tea, free welcome drink, linens are just some of the facilities that can be found throughout the property. The property offers an excellent variety of recreational facilities, including fitness center, outdoor pool, pool (kids), karaoke. 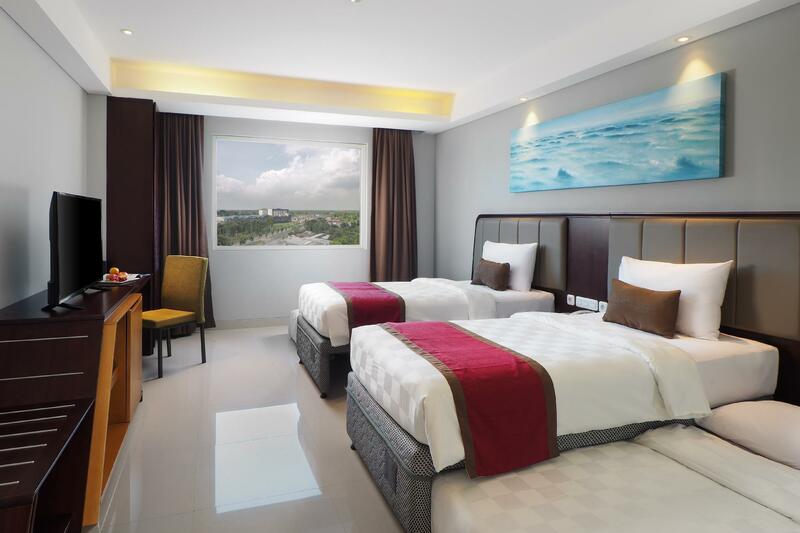 Prime Plaza Hotel Kualanamu Medan is a smart choice for travelers to Medan, offering a relaxed and hassle-free stay every time. Stayed here because I had a morning flight to catch the next day. The hotel provides free airport drop off. Room are nice and comfortable, but did not manage to use the facilities. I arrives late at night, and left early in the morning. Great hotel located a 5 minute drive from the airport. Very clean and friendly staff. Restaurant food is tasty and great value. The hotel also offer a free transfer to the hotel which was very helpful. They have a free shuttle bus that leaves every hour starting from 4 am (don't know the end time). This is super rare for Indonesia that it actually left ON TIME. We got to the airport in less than 10 minutes. The staff was extremely helpful and friendly. They also gave us a wake-up call that was ON TIME. The room was really clean and nice. The bed is really comfortable. A good hotel for the one night we needed before our early morning flight. The plus - One of the nearest and nicest hotel to the airport. It is fairly new, the room is surprisingly big (I love having a futon in the room), fast internet connection, big bathroom, and friendly staff. Free shuttle service to the airport is also provided. The minus - The nearest shops and restaurants would require you to cross the expressway which is not for the faint-hearted. But if you are just transitting for a day, I guess the hotel restaurant would do (the items are fairly priced, about 40k rupiah for a nasi goreng). Pro: - Location near airport - free shuttle bus every 2 hours - clean - pretty good breakfast - good size twin bed - friendly staff Con: - gym not available yet - air condition control panel need to be reset. the temperature automatically returns to 25 degree after 30 min. there is a setting to disable this. Unfortunately, most people don't know how to do this and will think that the AC is broken. - there is a morning call at 3:30 am to our rooms, and we did not order it. Overall, its pretty good. Cleanliness of washroom is terrible. Toilet bowl was dirty...brownish stain and the water was in yellow colour. Including water from taps and shower were in yellowish colour. Will not book this hotel in future. We arrived at the hotel after a frustrating experience with our flights and taxi drivers refusing to take us such a short distance and not in the best of moods. We were then greeted with fresh juice and smiles from all the lovely staff. They were so kind and helpful (and spoke great English) that we were immediately placated. We arrived in time to hop in the pool and have a nice dinner in the restaurant which were both great before an early sleep for our 4 am complimentary ride to the airport. If you ask a few days in advance they can also pick you up from the airport (wish I had read that!!) and book spa treatments or anything else you want or need. The rooms were nice, spacious, and clean and provided complimentary bottled water which we really appreciated. Beds were also super comfortable. I liked this hotel way better than anywhere we've stayed actually in Medan, and so much more convenient for a short transit stay. Great beds, great shower, 10 minutes from the airport and friendly staff. Of course the location isn't interesting at all, but you also only need to sleep here want you need to stay close to the airport. I believe that this is a very efficient and comfortable option with a very good price/quality ratio. Might walk opposite for food. Hi Mr/Ms. France, Warm greetings from Prime Plaza Hotel Kualanamu Thanks for staying with us. I have seen your reservation is it room without breakfast or room only. If you want a room included breakfast, you can choose a room with breakfast on the menu of choice of room. because we had 2 choices, not with breakfast and with breakfast. Kesen pertama, lihat kamarnya woke banget, luas dan nyaman, wangi, toplah pokoknya. Ditambah layanan shuttle car ke bandara KNO, menjadi hotel ini cocok buanget buat transit. Missed your flight? Flight cancelled? Great place to stay instead of going to town. New hotel with excellent staff and value for short staying.